In May 1890 Van Gogh left southern France to live in Auvers, a small town just north of Paris, where he rented a room at the inn of Arthur Ravoux. 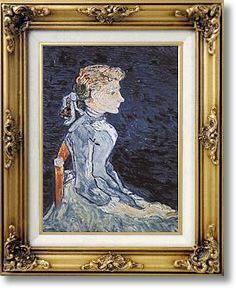 He painted three portraits of Ravoux's sixteen-year-old daughter, Adeline. Although known for his landscapes, Van Gogh's greatest ambition was to paint portraits. "I should like to paint portraits," he wrote to his sister, "which a hundred years from now will seem to people of those days like apparitions...".